The Crestliner 24 Rally DX pontoon boat is ready for fun in the sun. 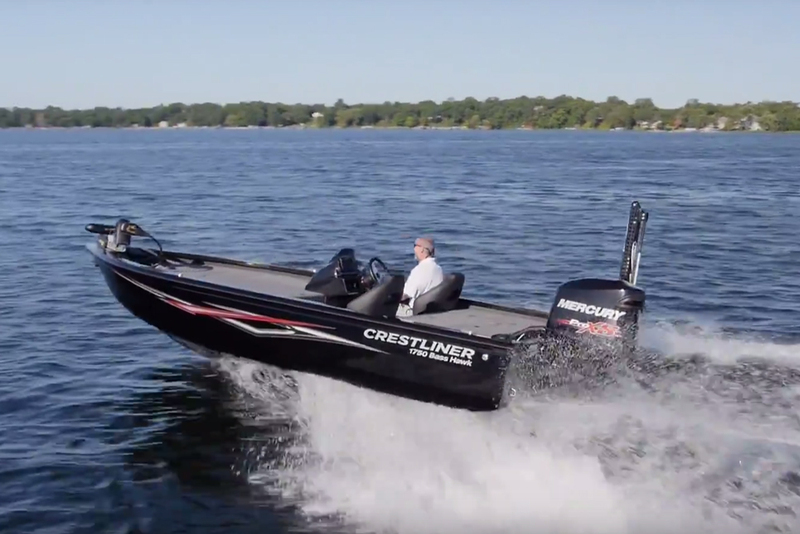 One of the best things about pontoon boats like the new Crestliner 24 Rally DX is that you can have a huge crew of friends and family aboard, and there’s a comfortable spot for everyone. Depending on which layout you choose with this boat you have room for up to 16—yes 16—people. And everyone can kick back in a puffy, luxurious “pillow-top” seat or a bucket-style armchair seat. Now add in a pontoon boat’s natural stability, copious stowage, a big standard Bimini top, and an optional pop-up changing room with a head. No matter how nice your lakefront vacation home is, you may well be more comfortable afloat on the 24 Rally DX. And we say that after having spent an entire day aboard one, cruising back and forth across Lake Darling, MN. 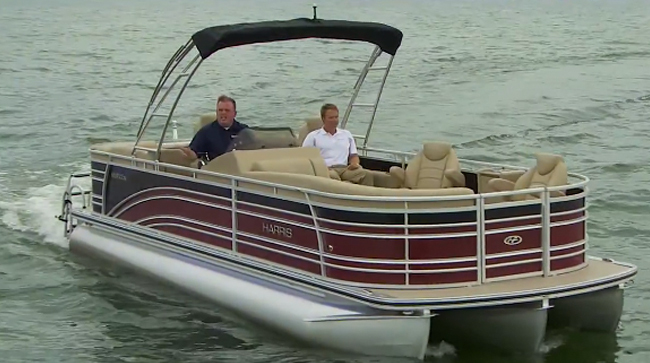 Jump aboard with us in this video boat review, and take a look at what we discovered. 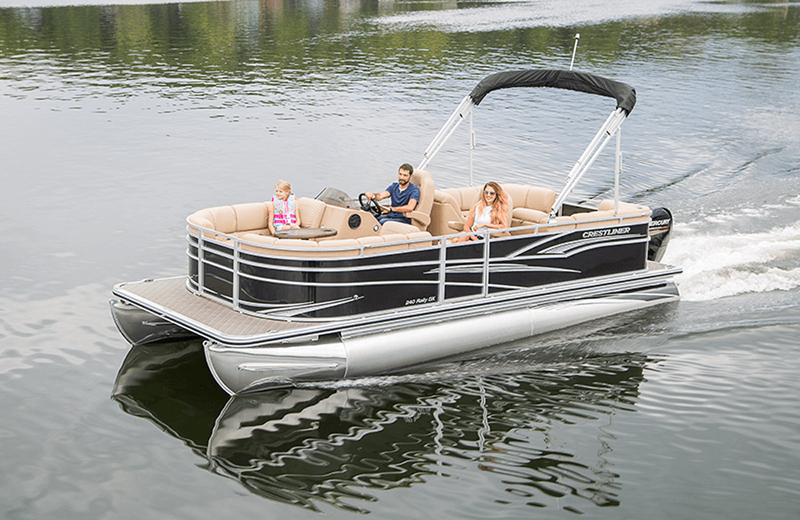 While we’d say this model falls into the Luxury Pontoon Boat category, we’d note that with the three-tube V3 Action Package and top-end speeds in excess of 40 MPH, it’s coming close to entering the Performance Pontoon Boat realm. No, it doesn’t reach that magic 50 MPH mark, but for an average pontooner on an average lake, 41.9 MPH is quite peppy. And with the ski tow bar, that also means this rig is ready for some serious watersports action. One of the items we couldn’t dig too deeply into in that video—beyond Crestliner’s extensive use of heavy-duty stainless-steel parts—was the boat’s construction. The tubes themselves are 24’ long, have a 25” diameter that’s boosted to 27” with the V3 Action package, and are 0.080 gauge aluminum. Nose-cones are reinforced, cross-members are extruded aluminum, and the deck is constructed with the industry standard three-quarter-inch marine-grade pressure-treated ply. An under-deck aluminum skin, full-length keel, and strakes are all options that are included in that V3 package (see Boating Tips: Should You Get a Pontoon Boat, or a Tri-Toon, to take an in-depth look at the difference between two tubes and three). Other optional items included in the package are full-length torsion control rider brackets, hydraulic steering, and a fuel capacity increase to 37 gallons. Our one construction beef, as we pointed out in the video, is that wobbly cocktail table. Unfortunately, this seems to be an issue on virtually every pontoon boat we test. We also wish the console door didn’t scrape on the center tube stowage compartment hatch. For a boat that will usually be used on lakes and rivers the 24 Rally DX is surprisingly well-built, including an extensive use of stainless-steel. In fact, the only thing the “Saltwater Package” adds is sacrificial anodes. Beyond the floorplan changes we discussed in the video, you can also get the 24 Rally DX in fishing versions. Many people are interested in getting a pontoon that can do double-duty as a fishing platform (see Can a Pontoon Boat Be a Serious Fishing Boat to read up on the ins and outs of choosing a pontoon for fishing). In the FC trim the aft lounger gets cut short and a pair of fishing seats are mounted in the stern, and you get an added rod rack for up to eight rigs plus a fishing station at the transom with a 15 gallon livewell, a washdown system, four vertical rod holders, and a tool/rig holder. The FS trim takes it a step further, eliminating the forward loungers for two more fishing seats plus bow fishing stations including a forward livewell. 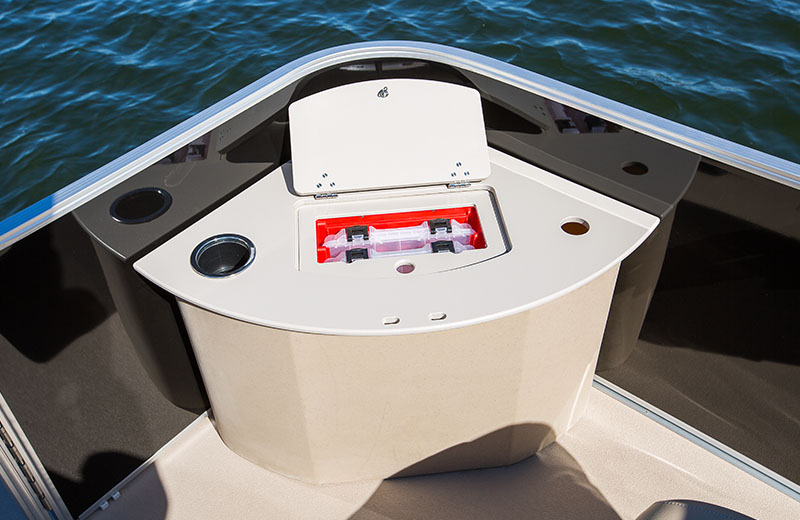 In the FS trim, the bow gets forward fishing stations with a livewell on one side and built-in tackle trays on the other. 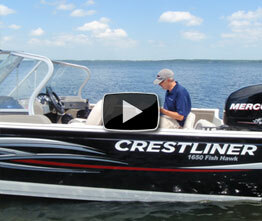 What else do you need to know about the Crestliner 24 Rally DX? Any remaining questions can be answered at the Crestliner web site. 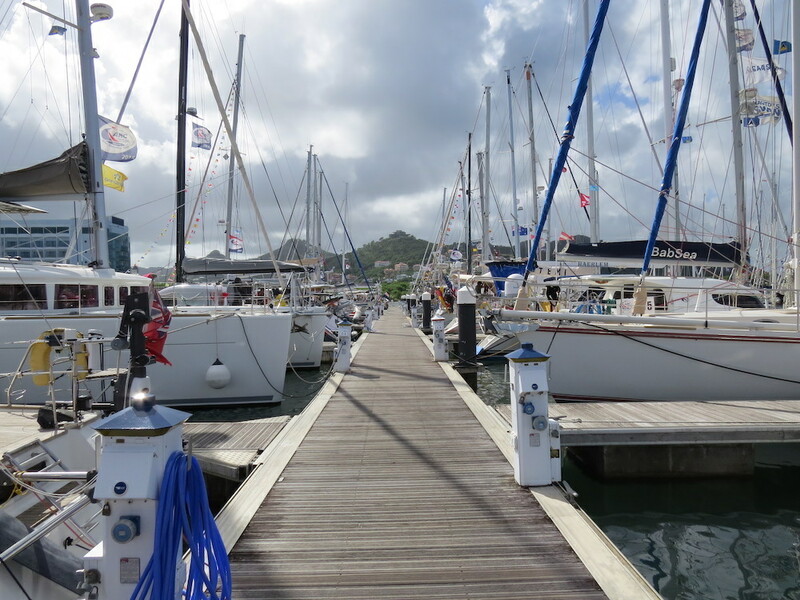 They have an excellent “build your boat” function which allows you to pick and choose options and floor plans, plus color patterns inside and out which allow you to customize the boat’s looks to a large extent. And yes, pricing information is included (thanks you crestliner!) 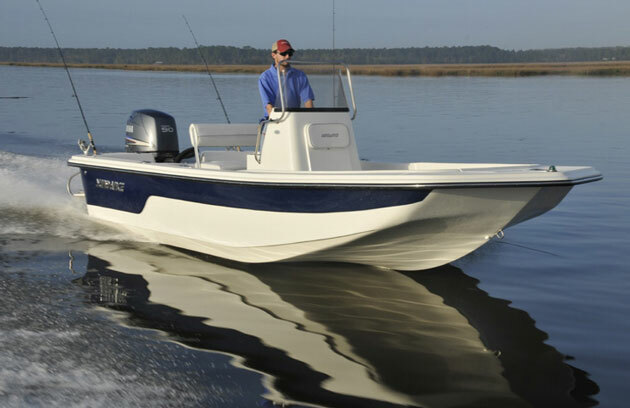 That said, the base-boat starts at $22,370 with a 9.9 four-stroke. Obviously folks who don’t do their boating on a lake with power restrictions will want a larger power-plant, so a more realistic mark is about $29,000 with a 115 HP outboard. Any way you cut it, however, the pricing is quite reasonable—so the final piece of this boat-buying puzzle will be a sea trial of your own. 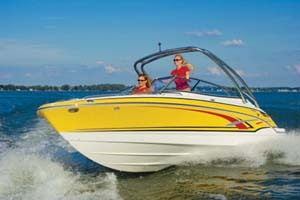 Other Choices: Interested pontoon shoppers will also want to see the Lowe Infinity 250 CL. This one’s a hair larger and costs a bit more, and features similar basic construction materials and methods. A slightly smaller model that may also be of interest is the Escape RT 220. And an even less expensive option would be the Princecraft Vectra 23, which shaves cost by utilizing a half-tube in the center instead of a full-length third log. 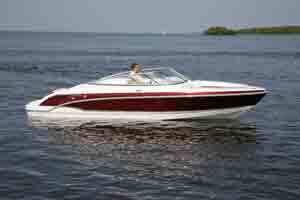 See Crestliner 240 Rally pontoon boat listings. For more information, visit Crestliner. Fuel capacity (2/3 tubes) 28/37 gal.